Christmas Snow Cat sweater will keep you cozy and warm during cooler months. 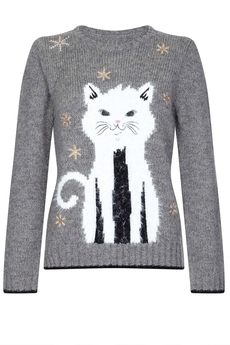 This soft wool-mix knitted sweater has a white eyelash jacquard cat, snowflake embroidery adorned with matt bronze sequins and ribbed edging with a contrasting detail. Designed for a relaxed fit, makes it perfect for a stylish winter look. It simply slips on and is approx. 65cm in length. Composition: 85% Acrylic, 15% Wool. Color: Grey.